Natural gas is increasingly being produced by a technology called hydraulic fracturing, or fracking. 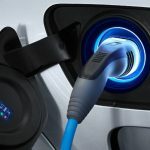 The technology is particularly widespread in the USA and Canada where very large quantities of natural gas are now potentially available using this technology. Approximately 1 million wells have been hydraulically fractured since the technique was first developed in the late 1940s. Around 25,000 to 30,000 new wells were drilled and hydraulically fractured in the US each year between 2011 and 2014, in addition to existing wells that were fracked to increase production. In 2016, about three quarters of a million wells were producing natural gas in Canada and the USA—about 200,000 in Canada and 550,000 in the USA. 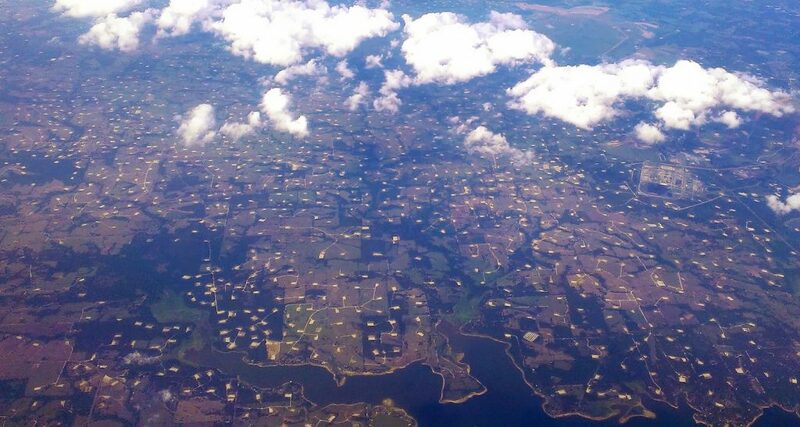 Not all these wells would have been fracked. But increasingly, natural gas is being produced from shale and ‘tight’ reservoirs that require hydraulic fracking to release the gas. Shale gas has been produced for decades from gelogical formations with natural fractures that allowed economic recovery from shallow vertical wells producing at low rates over a long time. But improvements in technology and higher gas prices have enabled the large scale production of much deeper shale gas reservoirs. 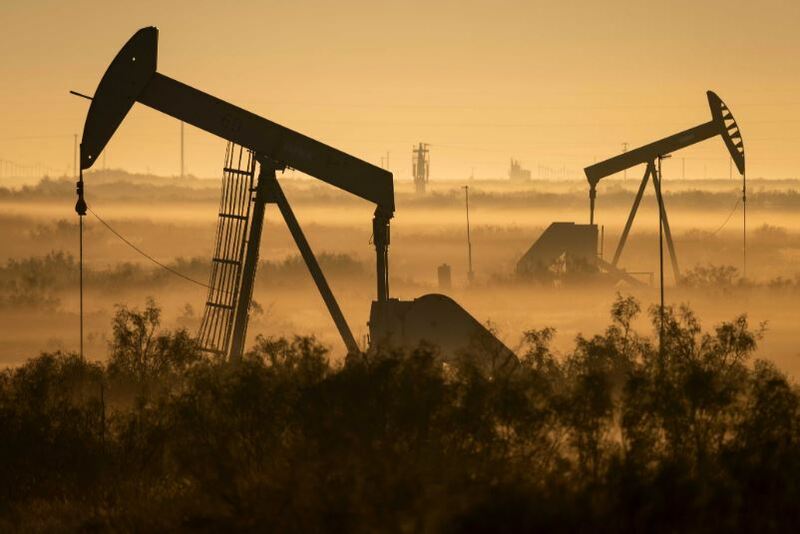 Fracking in shale formations was pioneered in the Texas Barnett Shale in the late 1990s when two different technologies: horizontal drilling and multi-stage hydraulic fracturing were combined. The gas well is drilled vertically from the surface and is then bent or kicked at a certain depth to penetrate the shale gas layer horizontally. This allows the wellbore to intersect a much greater part of the reservoir as well as a greater number of existing natural fractures. The horizontal part of the well varies in length but may extend out to as much as 3 km from the wellhead. Multi-stage fracturing involves injecting a fluid: usually water plus chemicals and proppants (which ‘prop up’ the fractures) at extremely high pressure into a shale formation in a number of places (stages) along the wellbore. This fractures the rock and creates a network of open fractures through which the gas can flow and be collected. 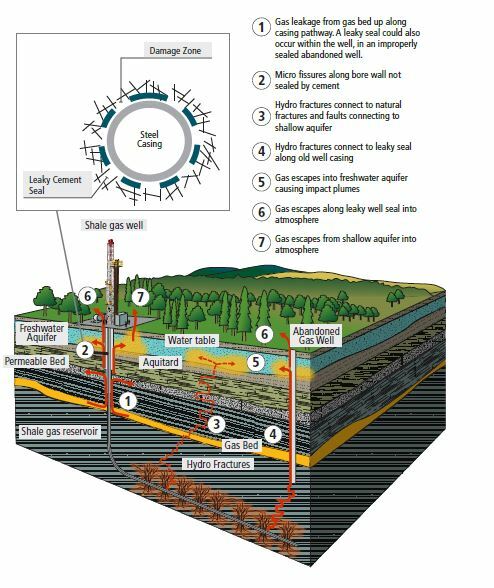 The figure below shows a schematic of a shale gas well, illustrating the various geological strata through which a well is drilled, and the relative depth at which hydraulic fracturing occurs. Lateral sections (the horizontal part of the well) are generally much longer than shown. The first two insets show the various casings (the steel tubing) that are inserted into the well and cemented into place. The bottom inset shows details of a stage: a section of pipe between two packers that has been perforated in order to inject the hydraulic fluid to fracture the shale. Horizonatal drilling and multi-stage hydraulic fracturing are not new or unique to shale gas development. Horizontal drilling has been used in Canada since the 1980s, primarily to increase heavy oil production, and hydraulic fracturing has been used extensively since the 1950s. But what is new is the combination of these technologies: the use of greater amounts of water, sand and chemicals, and the higher injection rates and pressures employed to fracture a much larger volume of rock. The scale of the development is also what differentiates shale gas development from conventional gas production. Although both conventional and shale gas development requires the construction of well pads, work camps, roads, and pipelines–shale gas development requires more of these activities. Even with multi-well pads, shale gas development will generally lead to more pads being built and more wells being drilled than would be needed to produce the same volume of gas from conventional gas reserves in high-permeability reservoirs. Natural gas burns cleaner that coal or fuel oil. But hydraulic fracturing, like all fossil fuel exploration and production systems, has a very substantial environmental impact. First and foremost is the environmental impact of hydraulic fracturing on surface and goundwater resources due to pollution by wastewater, the chemicals used in the injection process, and gas leakage from the wells. Secondly, there are significant emissions of methane from the wellhead and gas processing sites; and thirdly, the localised collection and pumping of the gas to its processing site (the ‘gathering’ pipeline network) carries substantial risks. Wastewater disposal and reuse: the disposal and reuse of the liquid waste streams from the well site. Some wells in the US use as much as 7 million gallons of water per fracture. In British Columbia, fracturing can reportedly require as much as 25 million gallons. Providing this amount of water to a wellsite requires hundreds of trips by diesel-engined tanker trucks transporting water to the site. In principle, a lot of this water could be reused, but the proportion of water used in fracking that comes from reused wastewater appears to be low. The EPA report states that the median percentage of the injected fluid volume that comes from reused wastewater was only 5% between 2008 to 2014. The impact on local water resources of this level of withdrawal for fracking purposes obviously depends on the local situation. The EPA report identifies one area in the US: Mountrail County in North Dakota where the annual average water use by over 500 wells was about 36% of the total water use in 2010. The withdrawal of water for hydraulic fracturing is a consumptive use of water–since some if it will remain in the shale gas formation and not flow back to the surface. However, the absolute quantities of water withdrawn are often less important than the times and rates at which water is extracted. Fracking uses a lot of water over a short period of time—several days. 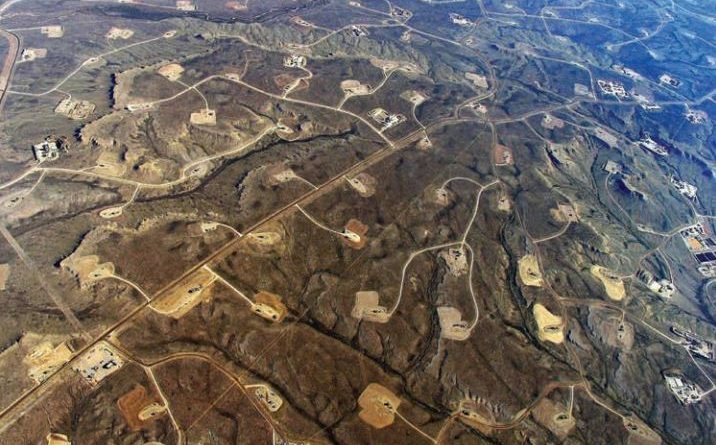 If several fracking operations happen sequentially, as they would in a multi-well pad, or concurrently on different pads, the demand could exceed the local unallocated supply for that period. Based on the US average of 19,000 m3 per well, a well pad with eight wells could use some 150,000 m3 of water within two to three months. A 2018 study of high-volume water withdrawals for fracking in Arkansas, USA, found that the permitted 12-hour withdrawal volumes exceeded median streamflows at half of the sites monitored in June 2017 when streamflows were low. But it is the mix of chemicals that are an essential part of the hydraulic fracturing process that is most alarming. The US Environmental Protection Agency identified over 1,000 chemicals that were reported to have been used in fracking fluids between 2005 and 2013. A given well will use anywhere from 4 to 28 chemical additives in a fracking operation. Three chemicals: methanol, hydrotreated light petroleum distilates, and hydrochloric acid were used in 65% of the wells reporting to the Fracfocus database. These chemicals are transported to the well site and stored on site until they are mixed with the base fluid and proppant and pumped down the production well. While the quantities added to the fracking fluid are very small, the amounts stored at the well site are not. Thousands of gallons of chemical addditives can be stored on site for use during the fracking process. The chemicals are stored in multiple closed containers and pumped around the site in hoses and tubing. Spills and leaks are inevitable. The EPA reported 151 spills of fracking fluid or additives in 11 states between 2006 and 2012. The mean quantity of fluid released was 1,600 litres, but the largest spill was over 73,000 liters. Thirteen of these spills polluted local surface waters. In Pennsylvania, between 2008 and 2013, 10 spills of over 1500 liters that polluted surface waters were documented. The spills ranged from 13,000 liters to a huge one which was over 850,000 liters. 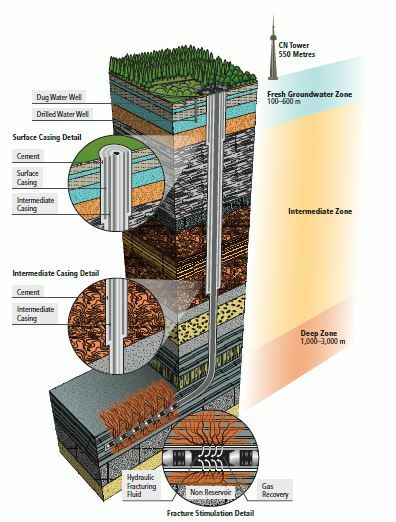 During fracking, the well is subjected to very high pressures. The fracking fluid is pumped into the well until the targeted rock formation fractures. Maximum pressures can range from 2000 psi to 12000 psi. The well casing, cement, and other well components must be able to withstand these pressures so that the fracking fluid can flow to the targeted rock formation without leaking. Older wells that are fracked may not be able to withstand the fluid pressure. Older wells may also be fracked at at shallower depths, where cement around the casing may be inadequate or missing. There have been several documented failures of this type. 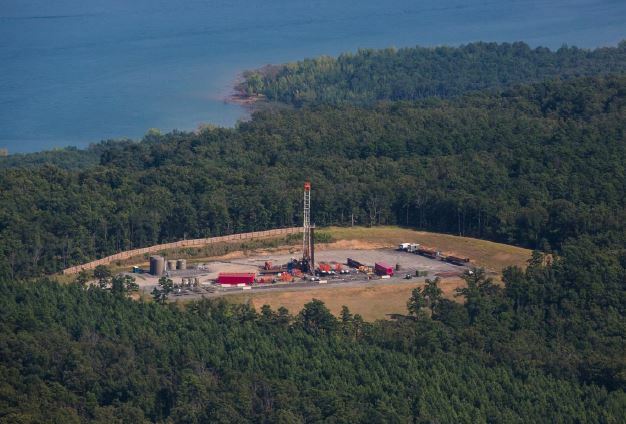 In one case, the fracking of an inadequately cemented well in Bainbridge Township, Ohio, contributed to the flow of methane into local drinking water resources. In another case, an inner string of of casing burst during fracking of an oil well near Killdeer, North Dakota, resulting in a release of fracking fluids and formation fluids that polluted a groundwater resource. In rural areas where homes rely on private wells for water, fracking operations pose a particularly high risk. Pennsylvania regulators have confirmed at least 260 instances of private well contamination from fracking operations since 2005. Independent journalists exploring the issue have documented over 2,300 complaints of pollution of private wells in 17 of the 40 pennsylvania counties where fracking has taken place. The integrity of the well is paramount. Mechanical integrity failures have allowed gases or liquids to move to underground drinking water resources. Fracking has even occurred within underground drinking water resources—which obviously rapidly contaminates drinking water wells. The schematic below shows the several pathways by which potable groundwater could potentially become contaminated by shale gas development. After hydraulic fracturing, the injection pressure applied to the well is released and the direction of flow reverses, causing fluid to flow out of the well. The fluid that initially returns to the surface after fracking is mostly fracking fluid and is sometimes called ‘flowback’. The fluid that returns to the surface during gas production is similar in composition to the fluid naturally occurring in the targeted rock formation and is typically called ‘produced water’. Produced water is usually stored in lined surface ponds or tanks before being either treated, used to fracture another well, or reinjected into a deep saline formation or, in the US, being reinjected into a Class II disposal well. Lined ponds, even when built with double liners, are rarely free from flaws and can be expected to eventually leak. Spills of produced water have been reported right across the US—ranging from 1300 to 3800 liters (the median values of several datasets). However, much larger spills have ocurred. In North Dakota there were 12 spills greater thn 79,500 liters and, in 2015, one huge spill of 11 million liters. 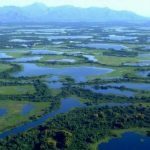 Many of the reported produced water spills contaminated surface water resources: the EPA reported that 13 of 225 spills polluted local creeks, ponds, or wetlands. One spill contaminated ground water. A report from California showed that between 2009 and 2014, 18% of spills impacted waterways. In yet another incident, pits holding flowback fluids overflowed in Kentucky in 2007, contaminating the Acorn Fork Creek. Saline produced water cannot be treated in typical municipal wastwater treatment plants because the high salinity negatively effects the activated sludge process. In addition, the naturally occuring radioactive elements brought to the surface in the producted water may be absorbed by the sludge or simply flow through the treatment plant and be discharged into the receiving waters. Hence, deep-well injection is generally the industry’s preferred option when the geology allows for this method of disposal. Shale gas is mainly methane—a powerful greenhouse gas: much more powerful than carbon dioxide in contributing to climate change and a warming planet. Just how powerful it is depends on how you measure its intensity. In contrast to CO2, which can lingers in the atmosphere for decades, methane breaks down fairly quickly—within 12 years. 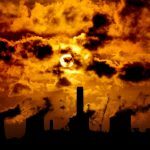 However, the impact of CO2 on climate change has generally been measured over a period of a 100 years. 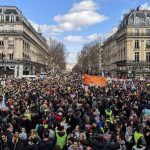 This is the convention which has been adopted by the IPCC–and which has generally been followed by climate scientists. If the same timeframe of 100 years is used for estimating the impact of methane, the gas would be considered to be about 25 times stronger than CO2 in inducing global warming. However, if a more realistic timeframe is used for methane–a shorter period which reflects its actual lifetime in the atmosphere, the impact of methane on global warming would be calculated as being much stronger: about 86 times as strong as CO2. This is important because the climate impact of methane as a greenhouse gas is measured in units of CO2 equivalent—written as CO2e or CO2eq. So is 1 tonne of methane equivalent to around 25 tonnes of carbon dioxide in global warming potential? 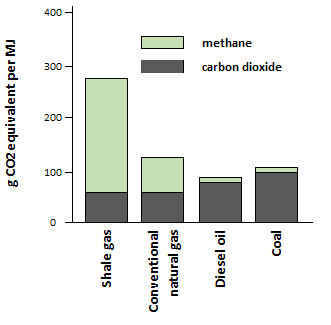 Or is 1 tonne of methane equivalent to about 86 tonnes of CO2? The smaller emission factor obviously tends to minimize the global warming impact of methane. 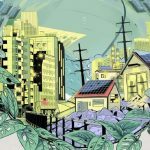 Natural gas is being touted as a clean fuel: and it is certainly cleaner than coal in terms of its emissions of carbon dioxide when fueling a power plant to generate electricity. Natural gas also produces less particulate air pollution, lower levels of nitrogen oxides (which can lead to the ground level ozone), and less sulfur dioxide than coal. Emissions of vapour-phase mercury are also insignificant—if the mercury is removed during up-stream processing. In other words, it burns relatively cleanly. But petroleum and gas processing systems can release substantial quantities of methane into the atmosphere. If hydraulic fracturing and the production and processing of shale gas release significant quantities of methane, the advantages of natural gas over coal quickly disappear. Emissions occur from well seeps after abandonment. There have been many attempts to accurately measure methane emissions from hydraulically fractured shale gas sites. The results are variable, inconsistent, and often contradictory. This may be because methane leaks from frack sites are likely to be sporadic, intermittent, and to some extent unpredictable. Surveys conducted at different times of the year and at different stages of the fracking process cycle wil give different results. In addition, airbourne releases are difficult to attribute to a specific site. However, there is absolutely no doubt that the hydraulic fracking of shale produces significant emissions of methane and carbon dioxide. A detailed peer-reviewed study in 2015 by Robert Howarth at Cornell University came to the conclusion that when methane emissions from shale gas production were accounted for, shale gas is not quite the clean fuel many proponents claim. Yes it burns cleaner. But the upstream production processes–starting with drilling the well–leak a powerful greenhouse gas into the atmosphere: methane. The chart shows the emissions of shale gas, conventional natural gas, oil and coal in units of grams of CO2 equivalent per unit of heat produced. The black bar indicates direct and indirect emission of carbon dioxide. The grey part shows methane emissions in equivalent amounts of CO2 using a global warming potential of 86. The data clearly show that greenhouse gas emissions for shale gas production and combustion are higher than for conventional natural gas, diesel fuel, and even coal. The difference is due to the release of significant quantities of methane during the production, gathering, and processing of the shale gas.